With summer on the horizon, Monty is planting up pots for summer colour as well as giving his box hedging a seasonal cut. Frances Tophill checks on the progress of crops on her shared allotment. Mark Lane is in Suffolk where he gives advice on the elements of successful woodland planting design, and Nick Bailey travels to a garden in Cheshire to answer a viewer’s query about how to plant up a rocky area of their garden. Plus a visit to a Worcestershire garden where the owner has created a garden with a tropical twist, and the final garden in the Every Space Counts competition is revealed. The show starts with Monty showing us Viburnum plicatum ‘Mariesii’ – the Japanese Snow Ball, comes from Japan and the Far East. Full of beautiful white flowers with a very distinctive format because of the branches for layers or tiers which carry the flowers on the top side of the branches. It will grow in light shade, in the sun and in most soil conditions. So it’s a great plant in summer but also in autumn, the foliage develops the richest colours, going from red to plum, to purple to almost chocolate. The strongest colour in the garden in October and November. Cobaea scandens – cup and saucer vine. – Now Monty is planting climbers in a big pot, previously used for tulips. Sowed at the end of March. This is a climber from the tropical areas of America. Flowers profusely with blueish, purplish cup and saucer flowers from mid-July onwards right into autumn until the first frosts – it’s a half-hardy annual. It’s vigorous and will grow up to 20 feet tall and is really good against a sunny wall or fence. It does like a fairly rich soil – which applies to most climbers as they have a lot of growing to do in a short space of time. Around the base of the pot, Monty planted petunias and Bidens ‘Hawaiian Flare Orange Grop’ – there’s a whole range that have marmaladed caramel colours, oranges touched with yellow work well in Monty’s jewel garden and also with the depth of colour from the petunias. Monty will feed the pot once a week with liquid seaweed. Box – it’s had a tough time over the last decade, box blight ripped through the country. Buxus sempervirens ‘Handsworthiensis’ Box – Monty has grown all of his from cuttings he took from one set of plants over 26 years ago. Its great virtue is it has very large leaves, upright growth and it seems to be blight resistant or at least able to recover from blight. He avoided clipping for a couple of years as blight enters via wounds and obviously clipping creates lots of wounds. Saturday, June 2nd is Derby Day and that’s the traditional day when you clip box. The key thing is to keep an eye on the weather, you want no rain for 3 or 4 days. You want to use nice sharp cutting tools to create clean cuts if blunt you rip rather than cut. Dip / wash the blades in a bucket of water every few minutes as Box has a kind of stickiness to it which makes clipping harder. The gardens were created by Bernard Tickner who died last year aged 93. During his lifetime he transformed an area with poor sandy soil into a tranquil woodland wonder. Now the grounds are in the safe hands of head gardener Annie Dellbridge. By following a few golden rules you can create the woodland of your dreams. It’s all about building layers. Thinking of the woodland as a theatre, the trees provide the upper circle with light and shade. Coming down to the mid layer, where the smaller trees come in really handy creating silhouettes and shadows that bounce off each other. Then there’s the understory of the ground over. A large area of comfrey was shown, Symphytum officinale blue-flowered – Common comfrey mixed with a white variety. It’s covered in bee’s – I noticed earlier how much the bee’s are loving the comfrey in my garden this year. For height, you could go for a fruit tree (which would be practical) but don’t be afraid to try something like Acer, or an ornamental cherry. For the mid-layers, we could go for a fern, but why not go for something grander like Tellima Grandiflora – fridge cups. For grown cover, pink Dicentra formosa and then continue the theme with Asarum europaeum – Wild ginger. This looks like a good activity to do with the children – it’s basically making mudpies! You need to mix the mixture up in a flatbottomed container that you’ll be able to press the soil block maker into. Then add water – more than you think you would need. Monty then goes onto sow Parsley into the eco soil blocks. It’s one of those crops that you need to sow successively to have a constant supply. Monty does three sowings a year. Frances Tophill checks on the progress of crops on her shared allotment. The salad crop was destroyed by slugs. They want to take an organic approach so won’t be using slug pellets. Frances uses Sheeps Wool Pellets which the slugs don’t like to cross. One of the other allotment holders has a pond to encourage frogs which will eat the slugs, they also have a few chickens which are great for clearing beds of slugs and other insects – it’s about working with nature. A good set of plants for a difficult rock garden. Citrus x corbariensis – white tissue like early summer flowers. Stipa tenuissima – Mexican feather grass. Cotulahispida – Silver Cotula – to provide interesting ground cover. Euphobia myrsinites – Broad-leaved glaucous spurge. Monty talks about adding loam to the soil for the Olive. It’s soil with a very high organic content. It adds bacteria and fungi to add some life to the mix. They are quite hardy and can survive down to -10, but don’t bet on it protect them if you can. Best to grow in a pot so you can move them. Olive fruit on last seasons growth. The best time to prune is early Spring but you won’t do any harm doing it now. Monty will water them well and feed once a week through to late summer.. If you can lift the pot and have space they will be much happier inside in winter but don’t bring them into the house as it will be too warm and humid. Somewhere cool but not freezing. Joe Manchester, Worcestershire garden a woodland garden with a tropical twist. Joe has been developing his garden for the last 17 years. He opens his garden for the NGS. He originally came from a little Caribbean island called Nevis. He came to England in 1967. His dad came first who was a keen gardener. He raises money for the local hospice in memory of his mother who died from breast cancer by opening his garden. He has some lovely hostas, ferns, ligularis. The podophyllums are weird in a sense because the pattern looks like a frogs back. He’s growing lots of varieties of ginger. Hosta ‘White Feather” – most of the plants in the garden are Hosta’s and this is Joe’s favourite. The other is Hosta ‘Chinese Sunrise’. His other tip to stop slugs eating his Hosta’s is to boil garlic in water and then spray the leaves with the water – not a single slug bit insight in Joe’s lovely garden. Joe’s garden is open by appointment until the end of August. It’s done this time of year around the time of the Chelsea Flower Show. People make the mistake of thinking it’s a tidying process but it’s not. It’s all about pruning late-flowering perennials to control the rate of their growth, the timing of their flowers and different heights. Monty demonstrates the principle with his Lysimachia ciliata ‘Firecracker’ Loosestrife. It’s got dramatic purple leaves with tiny very vivid yellow flowers. If left the whole clump would grow to about a meter and the flower towards the end of July / beginning of August. Monty cuts some of it back (ie gives it the Chelsea Chop) by between a third and a half. This helps it establish side shoots and then the part of the clump that was cut back will flower later than the part which was left – to extend the flowering period. The other advantage is that the section which is cut back won’t grow so tall so it adds some structural shape to the clump. Aster umbellatus – Flat-topped aster – Monty loves it. Tiny white flowers from July until Autumn. A good example of where to apply the Chelsea Chop. Only to be used on plants which have not yet set their buds or flowers. A gardening technique well worth understanding and mastering! Gardening jobs for the first weekend in June. Water newly planted trees and shrubs and give them a good soak for the rest of summer. Pot up peppers and chillis. 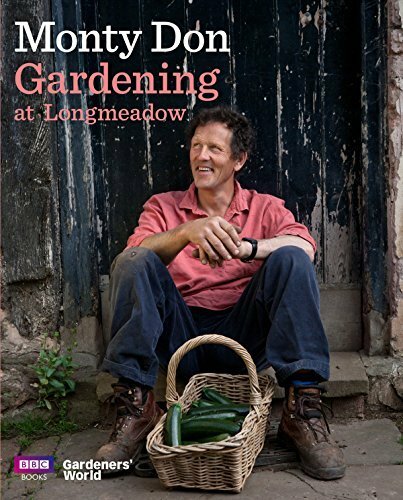 See my Monty Don reading list here.